The kingdom of heaven is like unto a certain king, which made a marriage for his son, and sent forth his servants to call them that were bidden to the wedding: and they would not come. Again, he sent forth other servants, saying, Tell them which are bidden, Behold, I have prepared my dinner: my oxen and my fatlings are killed, and all things are ready: come unto the marriage. But they made light of it, and went their ways, one to his farm, another to his merchandise: and the remnant took his servants, and entreated them spitefully, and slew them. But when the king heard thereof, he was wroth: and he sent forth his armies, and destroyed those murderers, and burned up their city. Then saith he to his servants, The wedding is ready, but they which were bidden were not worthy. Go ye therefore into the highways, and as many as ye shall find, bid to the marriage. So those servants went out into the highways, and gathered together all as many as they found, both bad and good: and the wedding was furnished with guests. And when the king came it to see the guests, he saw there a man which had not on a wedding garment: and he saith unto him, Friend, how camest thou in hither not having a wedding garment? And he was speechless. Then said the king to the servants, Bind him hand and foot, and take him away, and cast him into outer darkness; there shall be weeping and gnashing of teeth. For many are called, but few are chosen (Matthew 22:2-14). The wedding or marriage feast, where there is always much light, joy and merriment in the presence of the groom and bride, has of old been a symbol of the Kingdom of Heaven. The Old Testament Israel already knew this symbol from the works of King Solomon (see The Proverbs of Solomon, 9:1-6). The Pharisees constantly said that the Jews are God's chosen people and that the coming Kingdom of God is intended only for them. The people got so used to this prejudice that it was offensive to them to hear in the parable of the workers in the vineyard words from the Saviour threatening to them: The kingdom of God shall be taken from you, and given to a nation bringing forth the fruits thereof (Matthew 21:43). 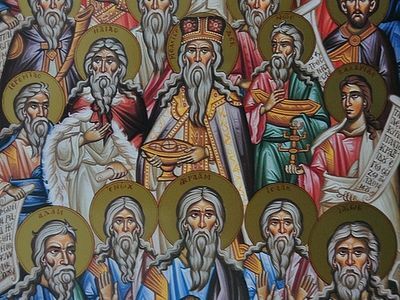 The Lord, the Knower of hearts, of course, knew of His audience's confusion, and in the new parable of those called to the marriage feast He explains to them what is needed in order to become a genuinely chosen man. The Kingdom of Heaven is like unto a certain king, which made a marriage for his son, and sent forth his servants to call them that were bidden to the wedding. The guests had been invited earlier; they already knew that king would have a wedding feast at a certain time, and that it would be given to them to know when it would be ready. But those that were called treated the royal invitation indifferently and did not want to come. The king good-heartedly excused the guests, who perhaps had delayed on account of some misunderstanding. Desiring, in his goodness, that those that were invited not miss the chance to enjoy a festival, he sent the servants once more to call them to the feast. However, those that were called likewise treated the second invitation coldly and disdainfully. Mercenary, purely worldly calculations were dearer to them than the honor of being among the guests at the marriage feast of the king's son. As if that were not enough—amidst those that were called were also found such who acted completely appallingly: and the remnant took his servants, and entreated them spitefully, and slew them. By offending the royal messengers, the subjects inflicted the greatest insult on the king himself. The high dignity of the king and the important reason for the celebration magnified the weight of the offenders' guilt. The most kind king could not endure this and blazed with righteous anger, and he decided at once to punish the guilty: and he sent forth his armies, and destroyed those murderers, and burned up their city. Meanwhile, the time of the feast arrived, and the king did not want his joy to remain unshared with his subjects. He ordered his servants to invite to the marriage everyone whom they would meet, without distinction as to their calling and condition. 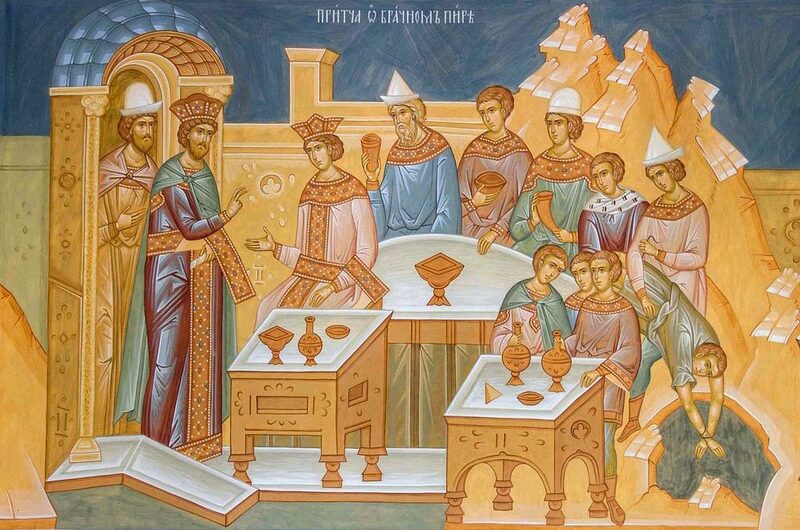 The royal servants began to call everyone, both the worthy and the unworthy, leaving it to the king himself to decide whom to seat at the royal table and whom to remove from the banquet. And quickly the festive table was occupied by guests. Everything was ready. Then the king came out to the banqueters in order to gladden them by his presence; but he saw something that upset him intensely: he saw there a man which had not on a wedding garment. One must know the eastern customs in order to understand why the king was upset at the sight of this man, and why he cast him out of the marriage feast. The fact is, that if those that were called to a feast did not have their own festive garments, they received garments at the entrance from the steward of the house. 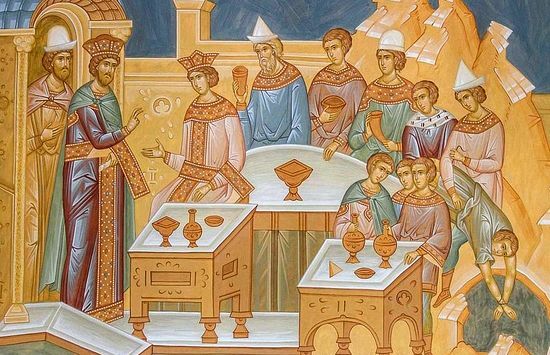 Anyone who refused to receive such a garment upon arrival expressed thereby disdain and even contempt for the master of the house, as if saying: "I shall eat and drink with thee, but I want nothing to do with thee." The king asked the man which had not on a wedding garment: …Friend, how camest thou in hither…? He was silent—that is, he had no justification whatever; he had the full opportunity to have this garment, but disdained this. This silence told of the depravity of his heart, and he himself passed sentence on himself. He was expelled for ever from the royal feast. The Lord concluded His parable with the words: Many are called, but few are chosen. 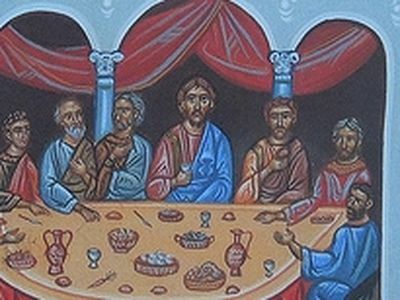 Not only those who did not come at all to the wedding feast belong to the number of these called, but not chosen, but also many of those who came to the feast, but did not want to be clothed in a wedding garment. The parable of the marriage feast, which was addressed to the chief priests and the Pharisees, relates, of course, not only to Christ's immediate audience, His contemporaries, but also to all the historical leaders of the Hebrew people, who always insulted and killed the prophets, the "servants of God" that were sent to them. The words about the "burning of the city" and the "destruction of the murderers" of the prophets is nothing other than the Saviour's first foretelling of the destruction of Jerusalem and the ruin of the ancient Israel because it "did not know the time its visitation". But the Pharisees did not understand this prophecy. In the parable of the evil vinedressers, the Lord indicated in only a covered manner that the Kingdom of God will be taken away from the Jews "and given to a nation bringing forth the fruits thereof." In the parable of the marriage feast, it is said more clearly that the time will come when the baptized pagans will enter into His kingdom. The call of the Word of God was addressed to all mankind. All peoples were called to the wedding feast. Modern Christians resemble in many ways those who refused to come to the feast and him who came to the feast in inappropriate clothing. 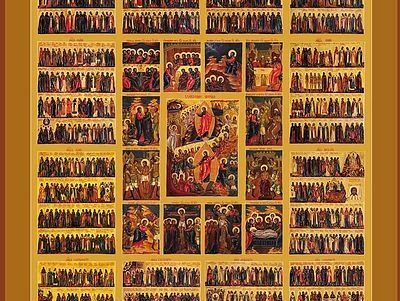 The Divine Liturgy is a feast constantly being performed in the world, to which the Lord invites us with love. What then hinders us from accepting the divine invitation to participate in the Holy Eucharist? Is it not most often those same cares which in the parable prompted those who were invited to refuse to come to the feast? Not infrequently we cover up this preoccupation by citing our unpreparedness. But is not this unpreparedness most often the result of undue preoccupation? Do we remember what awaits those who renounced their participation in this marriage feast? "With fear of God, with faith and love draw near!" "Taste and see that the Lord is good." "I see Thy bridal chamber adorned, O my Saviour, and I have no garment that I may enter there" (Exapostilarion for Great Monday). One must fear, but one needs also to enter. Just what is this non-wedding garment? This is, of course, the garment of the soul, the spiritual condition. He who comes in a non-wedding garment is he who only outwardly accepts all that the Lord and His Church teach and considers himself already justified by works of outward piety. Most likely it is those whom we now call Pharisees, hypocrites or ritualists. Such people even look at the very Mysteries as magical means. These are legalists who do not have a genuine inner life. Their lot is terrible, and it is self-evident that each of us is inclined to go by this easy, wide path of fulfilling only outward rules. We must struggle with all this, but not lose heart; we must repent, but also be bold, for, "a heart that is broken and humbled God will not despise" (Psalm 50). "Live in such a way", teaches Hierarch Theophanes the Recluse, "that the God of love will love thee with eternal love. Go forth to thy commerce, but watch, so as not to sell thy soul to the world through the acquisition of worldly goods. Go forth to thy fields, fertilize thy land and sow seed in it, so that with its fruits thou mayest strengthen thy body; but especially sow in the field the fruits of eternal life. Preserve the garment received in Holy Baptism pure and spotless until the end of thy life, that thou mayest be a worthy partaker of the heavenly bridal chamber, wherein only those enter who have a pure garment and burning lamps in their hands. Hi.I think this was a good articel for one reason - that people should remember how to behave in Church. They should be wearing a clean wedding garment by being polite (not in a western hypocritical Flanders from The Simpsons kinda way), not pushing and shoving and arguing over who stands before whom for Holy Confession, not counting up the money at the front candle desk (ching ching) when prayers have begun, not throwing ladies out the way as they venerate an icon in the middle of the church as one oaf did when the bishop came by to bless the icon. In other words don't scandalise others so you don't turn people away from the Church with your boorish lack of respect, and Pharisaism. Capiche?